With the advent of Android Nougat just months away, Samsung is essentially clearing out the lot. Starting with devices like the Galaxy A3 and the Galaxy J7, the South-Korean tech giant is finally bringing Marshmallow update for Galaxy S5 Mini. It certainly has been a while since the device got its last major update, which came as Android 5.1.1 Lollipop back in 2015. 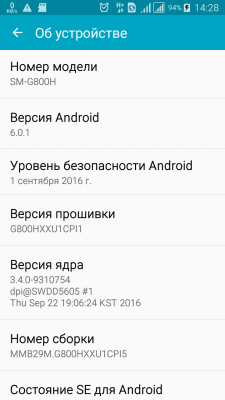 The latest reports by users over at the XDA Developers forum shows that the Android 6.0.1 update is already out for at least the Russian variant of the Galaxy S5 Mini. The Marshmallow update for Galaxy S5 Mini model SM-GH800H was released as an OTA, and has been spotted with the software version MMB29M.G800HXXU1CPI5. However, there is no official word from Samsung regarding the update for Galaxy S5 Mini devices. However, since the OTA update is being pushed out in stages, it could take a couple of days to reach across other regions. Do make sure that you have at least 50 percent battery charge and are connected to a Wi-Fi network before you begin the update. If you own a Samsung Galaxy S5 Mini, expect the Marshmallow OTA update to reach you soon. To check for the latest available update manually, simply open Settings->About phone->Software update->Check for updates. Do feel free to mention the changes and improvements you may have noticed. You can also keep an eye out for all the latest available Galaxy S5 Mini update on our Samsung firmware platform.